For people in parts of Mid North Coast and Hunter Forecast Districts. Issued at 5:31 pm Tuesday, 9 April 2019. Severe thunderstorms are likely to produce damaging winds in the warning area over the next several hours. 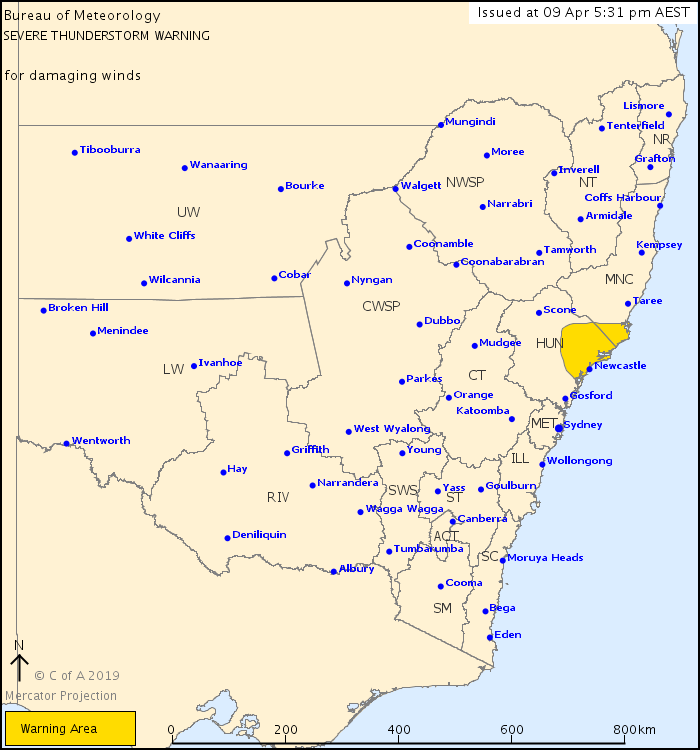 Locations which may be affected include Newcastle, Port Stephens, Cessnock, Maitland, Wallsend, Toronto and Dungog. 91 km/h wind gust was observed at Armidale Airport at 3:02pm. * Report fallen power lines to either Ausgrid (131 388), Endeavour Energy (131 003), Essential Energy (132 080) or Evoenergy (131 093) as shown on your power bill.